As promised, here's a look at some of the food from my recent work trip to China. I tried to make healthy choices, but sometimes just had to eat the delicious, delicious fried street food. Mostly worth it! The hotel breakfast during week 1 was pretty limited so I mostly went with the Chinese breakfast staple of savory rice porridge, either plain or with egg, chicken, peanuts, or veggies. When breakfast wasn't included with my room, I mostly stuck with yogurt, almonds, and a banana. My next hotel had egg white omelettes! At the same hotel, I figured out great go-to breakfast mixing "Chinese" and "Western" items from your typical big city reasonable hotel buffet. Baked sweet potato and pumpkin are normal Chinese breakfast items, and mixing them with yogurt, dried fruit, granola, and various other toppings from the cereal bar makes for a filling and pretty healthy breakfast. I love sweet potatoes for breakfast as you can tell from this week's meal prep overnight oats. I mostly ate lunch at offices or schools, which means a big bowl of rice with some kind of stir fried veggies and meat on top. When I did have a restaurant lunch and tried to order healthy-sounding menu items I didn't have great results. Exhibit A: Mostly parmesan, bacon, and crouton salad. Exhibit B: Omelette that unexpectedly came with a ton of cheese and french fries. 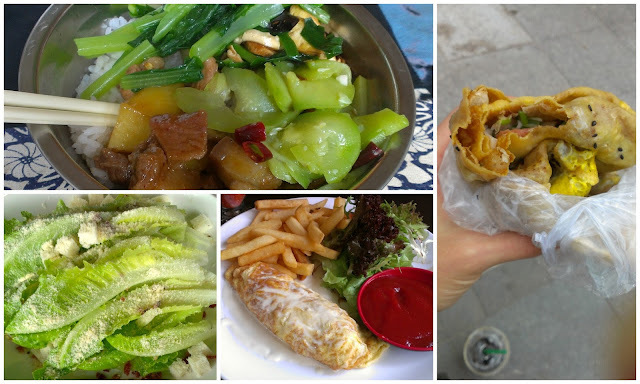 The best (/most unhealthy) lunch I ate was probably the jian bing I picked up on my way to the Beijing subway on the far right. Jian bing is a fried savory crepe made with wheat flour, topped with an egg, and most often stuffed with crunchy fried dough, sausage, cilantro, and sweet thick soy sauce. Crunchy, salty, sweet, spicy, warm, and FRIED tasting all at the same time, I consider it a small miracle I only ate one this trip. I didn't do a very good job of even attempting to eat healthy for dinner (lots of fried rice), but I did have a lot of delicious meals. The exception was the cheese and meat heavy room service salad in the middle. See any veggies? Me neither. 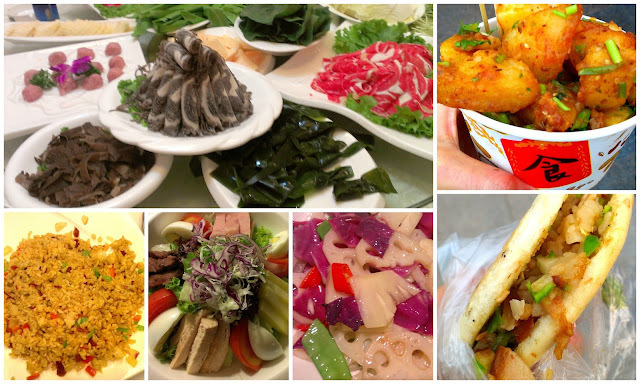 My favorite meal was either hot pot (the top left picture is less than half of what ended up on our table) or the delicious fried potatoes and rou jia mou (fried meat sandwich) street food meal on the far right. 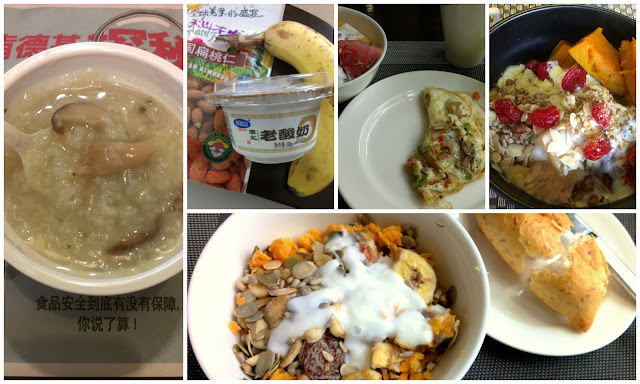 I did have one good healthy meal, at the Jujube Tree vegetarian restaurant in Shanghai. Lots of fresh tasting imaginative veggie dishes cooked without a lot of oil, the best of which was the pictured lotus root, purple cabbage, snap pea, and pineapple dish. I also consumed a dangerous level of caffeine during my trip. 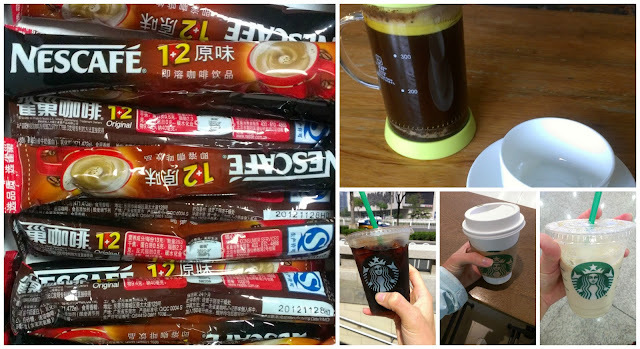 This included at least 4 cups a day of Nescafe during the first week while I was battling jet lag and without access to other caffeine options, a pretty good French press at Green House Coffee, and a lot of Starbucks. Q: What have you been eating lately? More Winning! And It's Terrifying!